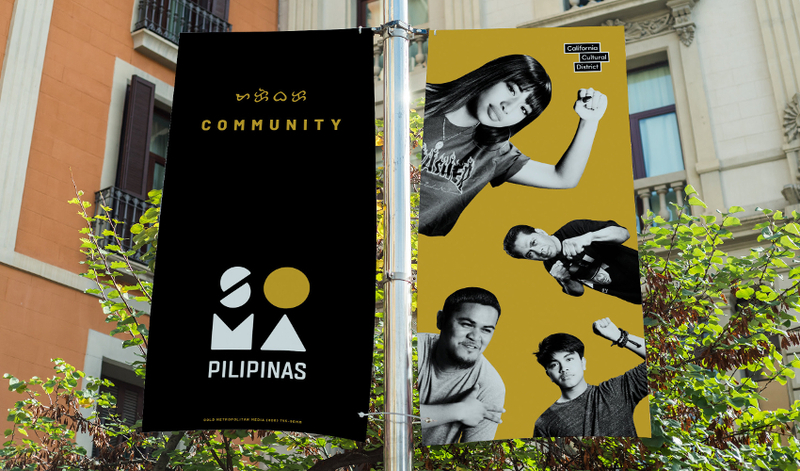 A pole banner representing the SOMA Pilipinas Filipino Cultural Heritage District. Depicted from top left are Kaitlyn Evangelista, YOHANA; Rico Remedio, West Bay Pilipino Multi-Service Center; Rey Novicio, Filipino Mental Health Initiative; Ramon Bonifacio, YOHANA. San Francisco has a reputation as a city that embraces diversity — but sometimes, cultural and ethnic groups that require social services still fall through the cracks. Against a backdrop of national anti-immigrant sentiment, community-based organizations in San Francisco are stepping up to help Filipino immigrants navigate American culture and access crucial social services according to a recent study by San Francisco State University researchers. Filipino immigrants have come to San Francisco in multiple waves, settling near Chinatown as early as 1910, according to Associate Professor of History Dawn Mabalon. The 1930s saw immigrants moving to the Western Addition/Fillmore area, and through the next two decades they began settling in the South of Market neighborhood (now designated as a Filipino Heritage District called SOMA Pilipinas). Despite this long history of settlement in the city and a legacy of serving as nurses, teachers and childcare workers, Filipinos often feel overlooked, and rather than being perceived as a community in need are sometimes dismissed as “model minorities," said Francisco-Menchavez. Francisco-Menchavez and her team of researchers interviewed members of 15 community-based organizations in San Francisco that serve Filipino populations. They found that even though the city is required by law to translate all social services materials into Filipino — the city’s third certified language after Spanish and Chinese — it does not always do so. When it does, materials are often translated poorly. Filipino community-based organizations pick up the slack by providing language translation for city-based services, and so become “the pillar of support for Filipino communities for immigrant transition, economic, legal, educational and housing services,” the researchers write. “The community-based organizations told us they are providing [Filipino immigrants] with language and other services they don’t get from the city,” said Francisco-Menchavez. These organizations are based around the idea of “kapwa,” or community citizenship, and help Filipino immigrants become and remain empowered citizens with a collective political voice while also maintaining ties to their communities in the Philippines. Note to readers: Associate Professor of History Dawn Mabalon, who contributed to this article, passed away in August. You can read about her life, work and numerous contributions to Filipino/a American communities here. This study is part of a research symposium involving three other SF State professors: Professor of Political Science Ron Hayduk, Assistant Professor of Sociology Marla Ramirez and Assistant Professor of Political Science Marcela García-Castañon.